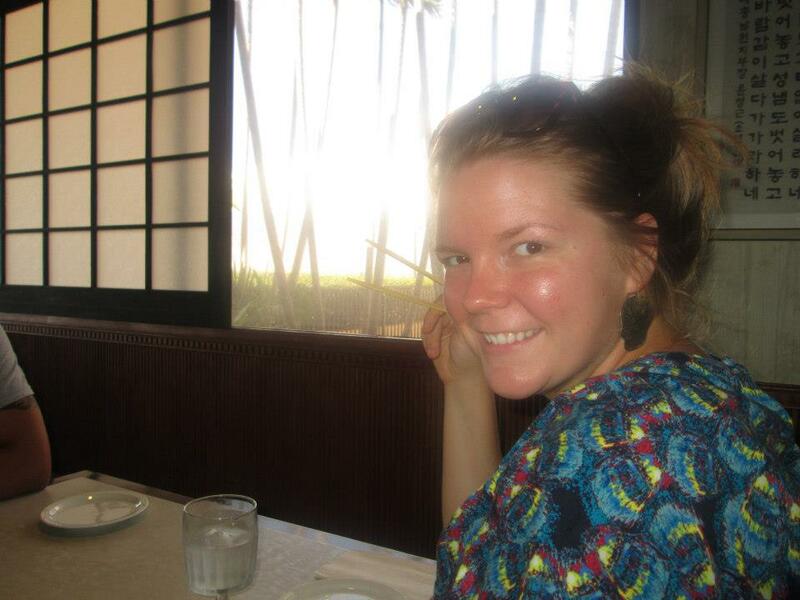 It’s no secret that basically all I do is gush about life in Hawaii. Is it really THAT good? To me, yes! Everyday I have a moment of blissful adoration for Maui, whether it be an amazing sunset I catch, a view of the mountains at just the right light, or a “Try Go Slow, Kids at Play…Mahalo” sign. What is it about this place that is so special? Among other reasons, I’ve comprised a list of 10 things I absolutely love about Hawaii, in no particular order. I know I can come up with many more…perhaps this will become a series of posts to come. 1. Always having dirty feet: No matter what I do to try to keep my feet clean, they always end up tracking some dirt or sand into the house. I think my heel is permasealed with dirt. Hey, in a place you can go practically anywhere barefoot, it’s liberating to go sans-shoes once in a while! 2. Wild chickens, roosters and peacocks roam around everywhere: I thought that chickens just lived in the country, but it turns out that even the suburban areas of Maui have roosters crowing at the crack of dawn, running across the street whenever they want and basically just living the chicken life (aka the goooood life) here in Hawaii. 3. 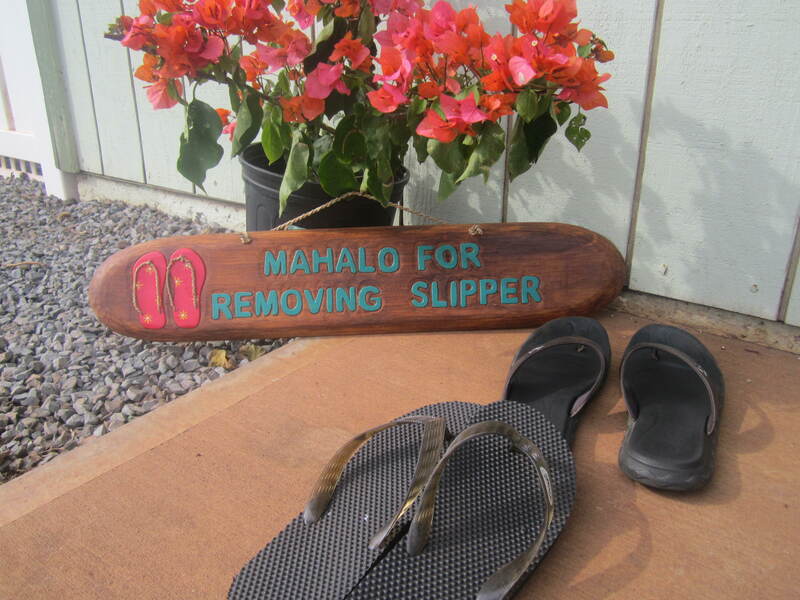 The Hawaiian tradition to remove your slippahs and shoes before entering the house: This is one of my favorite Hawaiian traditions brought by the Japanese plantation workers back in the day. You know the party is bumpin’ when you see a pile of 30 plus slippahs (sandals) and shoes outside the door. While house hunting, I met with a realtor who took off his dress shoes before entering any of the properties he showed us. That’s life in Hawaii…respecting your living space and leaving the outside outside (as much as possible since you’re likely to have dirty feet). 4. It’s legal, acceptable and FUN to ride in the back of trucks: Some of the most fun I’ve ever had was hitching rides in the back of pick-up trucks…Windy, rainy? Who cares? Sitting on a wheel well, cruising in the back while you’re being driven through a winding gulch is better and more beautiful than any roller coaster I’ve ever been on. Sometimes you see kids just chilling in the back of trucks or people parked up at the beach sitting in their beach chairs in the back of their trucks watching the surf. 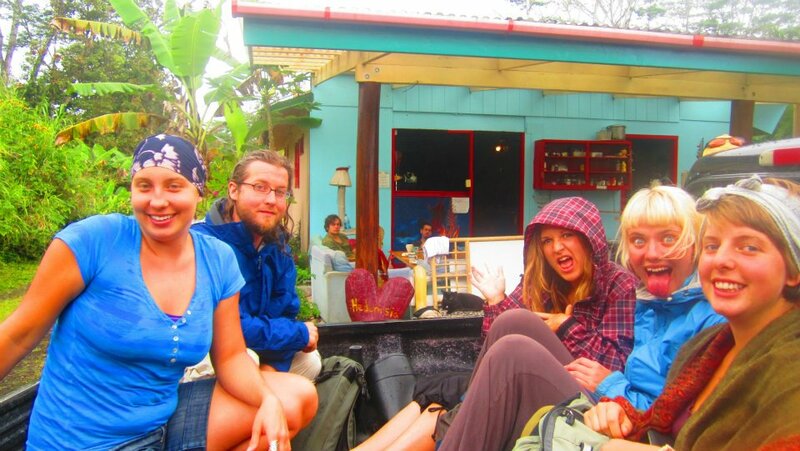 The back of a truck is a local hangout! I’ve probably used this photo 100 times, but c’mon..look at this fun group of hooligans! Five people, one truck. 5. Plastic bags at grocery stores have been OUTLAWED! 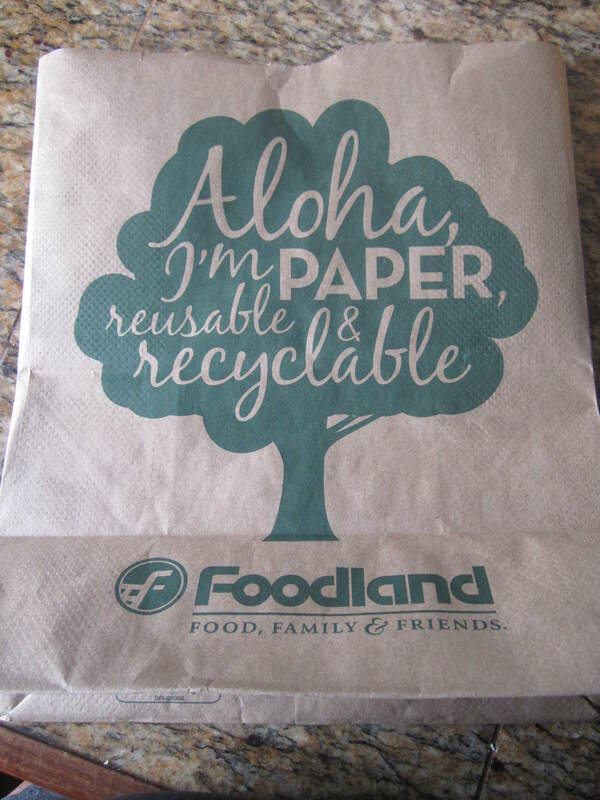 Paper & reusable bags only: My heart melts for this one. A place that’s actually environmentally friendly enough to BAN plastic bags? Rock on! Hawaii’s unique circumstance of being surrounded in all directions by thousands of miles of open ocean means that a lot of life here depends on keeping the oceans clean and healthy. Unnecessary trash and debris, especially plastic bags, threaten to ruin our most precious Eco-system. Plus, it’s just good practice to keep reusable bags in the car. 6. There’s a huge movement to buy local, farm-fresh produce: There’s a reason I wear a trucker hat with an emblem of the Hawaiian islands, a taro leaf and a recycle symbol signifying a movement for a sustainable Hawaii. Those that live here know expensive produce and food in general is because it’s shipped from the mainland. Those that are visiting usually can’t believe their eyes at our prices in the grocery stores. Who can blame them? Luckily people are in favor of buying local, organic, supporting the farmers or even starting their own farms. I’m in the process of weeding my yard so I can plant some herbs, veggies and fruits. Though right now I’m not in the position to live off my garden, I’d love one day to only supplement my diet at the grocery store rather than rely on it. 7. The availability of good food is mind-blowing: There’s sushi happy hours everywhere, ahi poke (raw, cubed ahi tuna dressed with sesame oil, soy sauce, sea salt, green onions, Maui onion, limu seaweed and chili pepper), plate lunches with mac salad, teriyaki beef, white rice, fresh Maui Gold pineapple, huli huli chicken (BBQ chicken), garlic shrimp, korean tacos, lau lau (pork steamed inside taro leaves)…The food alone is reason to live here, to be honest. 8. 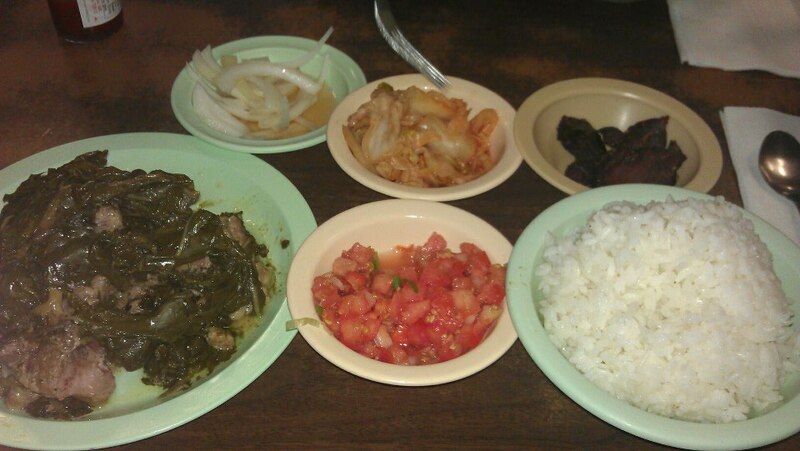 Hawaii’s a cultural melting pot: I can’t get over the cultural diversity here. I love it. There’s Hawaiian, Caucasian, Japanese, Korean, Chinese, Filipino, Vietnamese, Portuguese…what a great place to live! I get exposure every day to new customs, traditions and most interestingly, recipes from all these different cultures. It’s also awesome to think that I’m just as close to Asia as the mainland, so if I ever want to vacation to Asia, it’s not an arm and a leg away. Score on all accounts. 9. The lack of materialism: You would hardly know who’s a millionaire here and who is a beach bum. Dressing up in Hawaii is an Aloha shirt (you’ve seen ’em..typical floral print shirts) and khakis. Professionals only sometimes tuck in their shirts. You won’t be looked down upon if you rock a sarong and slippahs or drive around shirtless (guys). As far as I can tell, everyone is treated as an equal. 10. Having respect for the ‘aina: This is an essential for living in Hawaii and something I learn again and again here. To get respect, you have to give respect: for people, animals, plants and the precious land. Leave only footprints and make only memories is a phrase I hear often here.